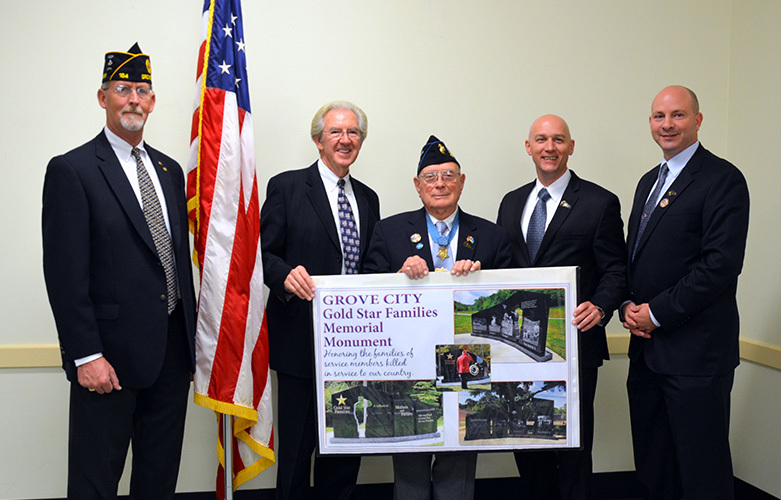 The last surviving World War II Medal of Honor recipient from the Battle of Iwo Jima, Hershel “Woody” Williams is working with the City of Grove City, Grove City Police Sergeant Chris White, Officer John Darnell and the Grove City Gold Star Families committee to recognize and advocate for the families of our country’s fallen military heroes with the Grove City Gold Star Families Memorial Monument. The Gold Star program is the result of Williams’ vision of honoring and paying tribute to the sacrifices of the families of fallen soldiers. The project, once funded, will be only the second Gold Star Monument in Ohio. For more information, visit the Grove City Gold Star Families Memorial Monument website visit http://www.hwwmohfoundation.org/grove-city.html or stop by Heartland Bank, 2365 Old Stringtown Road, to contribute to contribute to the Grove City Gold Star Families Memorial Monument fund.